Despite the early hour, the mood at the March BDA Breakfast was upbeat and cordial as City officials and members of the community came together to continue the celebration of the new Meydenbauer Bay Park. First the audience heard from City of Bellevue Parks Director Patrick Foran, who has worked on the project for 19 years. Foran spoke to the Grand Opening on Saturday, March 16, which over 1,000 people of all ages and abilities attended. Foran acknowledged community partnership as the theme of the entire project and spoke to the first few families who bestowed their waterfront properties to the future public waterfront. He also appreciated the City Council, whose long-view approach, skills and tenacity made the park as it is today, open to all who live, work or visit Bellevue, possible. Next up to speak was Glenn Kost, the City’s Park’s Manager. Kost explained that the park’s goal was to, “create a remarkable and memorable waterfront with a pedestrian-first message.” He explained that the variety of activities, including boat rentals in collaboration with REI, and inclusive design of the park achieves just that for all who wish to visit. Kost also let the audience in on some of the behind-the-scenes challenges and achievements of the park’s construction. Though Meydenbauer Bay is not the biggest of the Bellevue parks, the expanded waterfront creates nearly a quarter mile of accessible shoreline. During construction, the City removed 25 trees and planted over 200 and added over 16,000 plants and shrubs. To maximize the steep topography to the public’s advantage, the beach house and locker rooms are built into the hillside and the roof is an observation deck. To ensure the steep grade didn’t impede any mobility, over a football field (18 inches thick) worth of concrete snakes its way through the park creating smooth paths to gathering spaces and viewpoints which keep Bellevue true to its name. The new pier is the star feature of the new park, which via a curved 260-foot-long floating dock puts visitors in the bay. The pier actually floated its way into place under the 520 bridge! Kost reminded us that parks, unlike other city features, only get better with time as trees and plants mature and things settle into place. 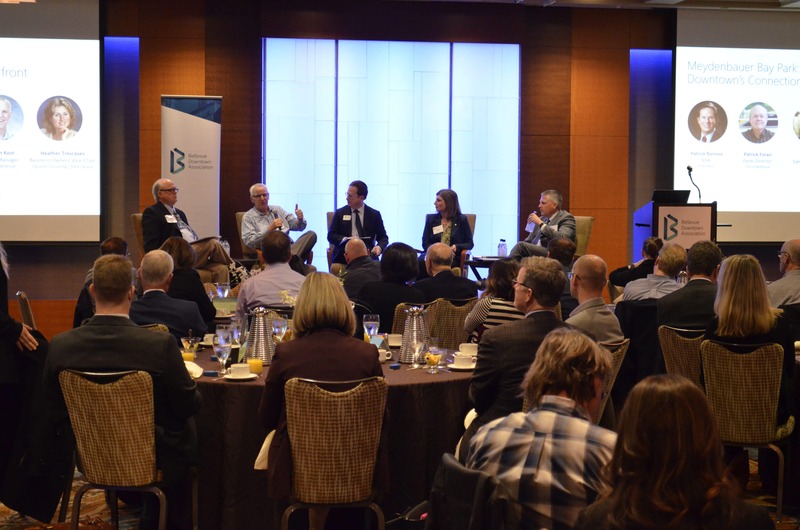 Finally, in a fireside-chat style sit-down, our speakers joined Visit Bellevue Executive Director Brad Jones and Bellevue Parks Board member Heather Trescases to answer some questions about the park’s impact. Both Kost and Jones spoke to the importance of the access the park provides, both to the water and as a connection to Old Bellevue. Jones sees potential for the park to spark a new Bellevue district focused around maritime and the homage to the site’s historic Whaling Company. Foran added the renaissance of waterfronts around the world, and how Meydenbauer Bay elevates Bellevue to new heights. All our speakers agreed that being kind to the park’s neighbors is an on-going collaboration, in some cases through trial and error (Kost explained that initially the park’s brilliant lighting was a little too much for neighbors at night). Though they’ve already been asked, the park will not currently allow weddings and private parties. In closing, the room applauded the career-long efforts of Foran, who will be retiring at the end of April. Thank you to our speakers, attendees, and congratulations to Patrick Foran, what a high note to end on!